When I started researching "Appalachian Love" traditions and such for this blog, I came across an article in Smoky Mountain Living that mentioned a courting tradition centered around something called a Love Spoon (sometimes spelled Lovespoon). I thought, "What in the world is a love spoon?!" Some of y'all may be asking the same question. Lucky for you, I couldn't get it off of my mind and can now answer that question. You can find this and many more beautiful Love Spoons here. 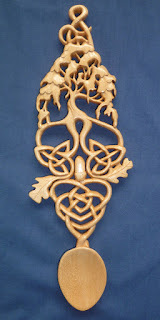 When a young man was ready to ask for a girl's hand in marriage, he would carve a spoon that was ornately decorated with horseshoes (luck), a cross (faith), bells (marriage), hearts (love), a wheel (ability to support), a lock (security), and other images that may relate to their family's lineage. This was a token to show the girl, and her father, that he was a skilled woodworker and was capable of providing for her and their future family. "The lovespoon is a traditional craft that dates back to the 17th century. 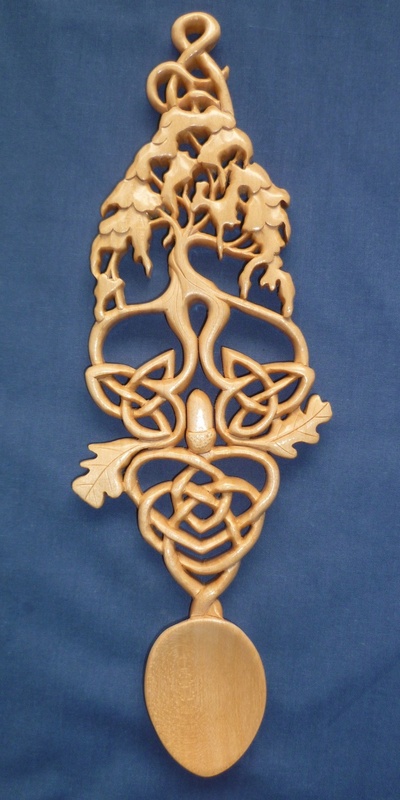 Over generations, decorative carvings were added to the spoon and it lost its original practical use and became a treasured decorative item to be hung on a wall. From what I've read, this custom was carried over from Welsh traditions. I'm a little sad that it isn't a custom that is frequently practiced in Appalachia today.. The men in my family (husband, Dad, and father-in-law) are all skilled woodworkers so I'm sure they could make some beautiful love spoons. While I didn't get a pretty spoon made for me when my husband and I were dating, he did make me a beautiful cedar hope chest and it is still one of my most treasured items. I don't know about you, but I'd rather have a gift like that over flowers that will wither away any ol' day. Had you ever heard of a love spoon before today? Maybe some of you actually own one? Please share pictures if you do...I'd love to see them!